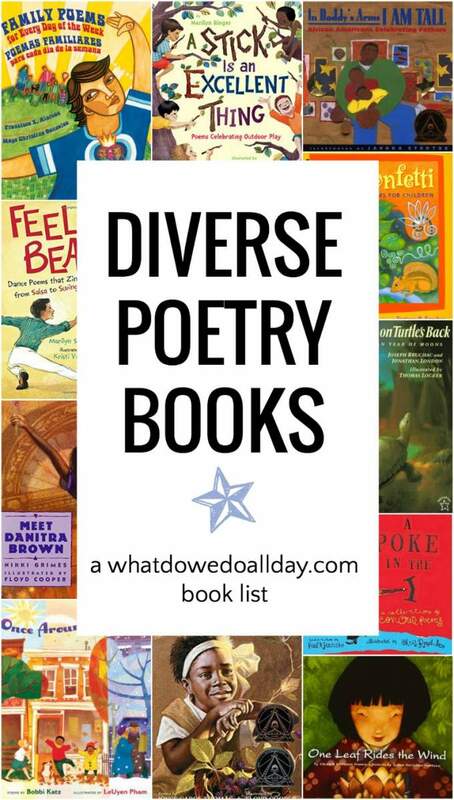 I love sharing poetry book lists and this collection of diverse poetry books for children is one of my favorites. (I might say that about a lot of my lists!) One of the reasons I love reading poetry to my kids so much is that it is so playful. Poetry shows us language is flexible, and most children’s poetry lets kids explore their emotions and experiences in a very positive way. A love of poetry may not come instantly or easily to every child (or adult!) 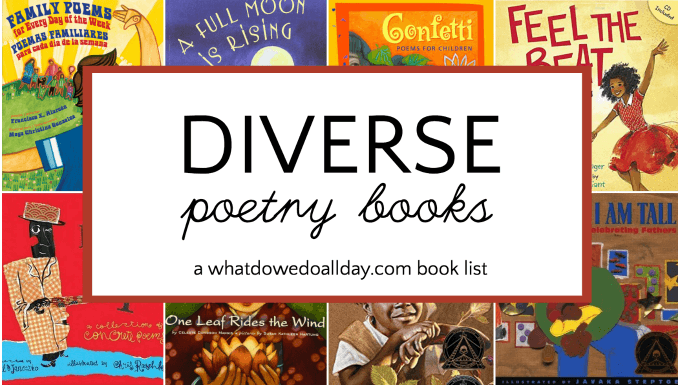 so I’ve taken care to choose diverse poetry books that are ultra-accessible. Feel the Beat: Dance Poems that Zing from Salsa to Swing I absolutely adore this book. Children will love this collection of short snappy poems about dance. Each one hold the rhythm of the music and the book includes a variety of cultures and traditions. The text comes with a CD of music because no doubt the poems will make everyone want to get up and dance! A Full Moon Is Rising. A collection of poems that celebrate the magic of a full moon as it is experienced around the globe. There are poems set it the city, the country and across the world from Africa to China to Colombia. Different religious and ethnic traditions are represented, including Sukkot, moon watching in Canada and the Chinese Moon Festival. This is truly a multicultural collection. The end papers include notes and a map of all the locations that appear throughout the book. A Stick Is an Excellent Thing: Poems Celebrating Outdoor Play is another collection by award-winning poet Marilyn Singer. Poems celebrate kids playing in the great outdoors, from the monkey bars at the playground to urban sidewalks to backyard sprinklers. Every single page features a diverse group of faces and almost every child will see someone who looks like them in this book. I only wish the collaborators had thought to illustrate a child with a physical disability in the book (they like to play, too! ); then it would be perfect. A Poke in the I is a collection of “concrete poems.” Concrete poems are poems in which the visual arrangement of the words on the page are as essential to the meaning as the text itself. For example, the text of the poem “Giraffe” is printed out in the shape of a giraffe. “Tennis Anyone” will have your eyes bouncing back and forth across the page. Kids love concrete poems for their playful nature, and creating their own concrete poems is a wonderfully fun writing exercise. Raschka’s stylized illustrations feature characters in every color. One Leaf Rides the Wind is a collection of counting poems in the haiku style. The poems follow a young girl as she explores a traditional Japanese garden. This is a great introduction to haiku and also includes information about gardens, haikus, and their place in Japanese culture. Iguanas in the Snow: And Other Winter Poems / Iguanas en la Nieve: Y Otros Poemas de Invierno is a bilingual collection of poems that is part of a four book series spanning the seasonal year. Each short poem in free verse is in both Spanish and English, presenting snapshots of a diverse group of children enjoying wintery life to the fullest. Be sure to read the poetry collections for every season! Family Poems for Every Day of the Week: Poemas Familiares Para Cada Dia de la Semana. Joyful poems about family activities—like visiting, celebrating, working and playing—during the week. This collection of diverse poetry is bilingual English-Spanish. Thirteen Moons on Turtle’s Back: A Native American Year of Moons. I’ve always loved the idea of naming all the moons of year. This beautiful book of diverse poetry celebrates the Native American year through each of the thirteen moons. I love Javaka Steptoe’s collages that illustrate Nikki Grimes’ haiku in A Pocketful of Poems. Tiana has pocketful of words and each word inspires a delightful short poem. I’m especially fond of haiku as “poetry for beginners” and its short form makes it easy to share with even the youngest kids. Tan to Tamarind: Poems about the Color Brown. 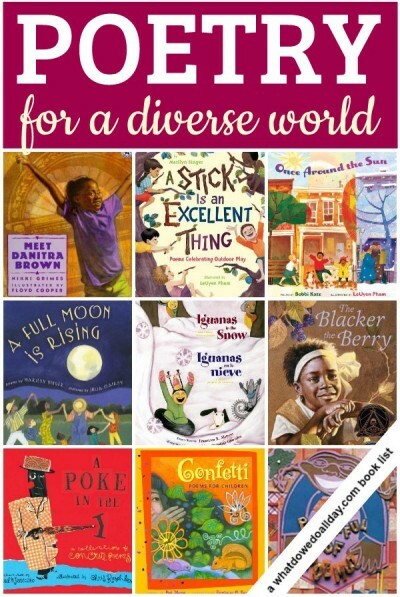 One of the earliest poetry books for children to that celebrates diversity! A classic (sadly out of print, so check your library!) collection of poems about all the gorgeous skin colors in the world. Once Around the Sun. Each month gets its own poem capturing the type of childhood moments we might look back on with nostalgia. In the background, a diverse group of children romp and play through the seasons and around their city. I’m in! I used to recite poetry and wrote poems, so it is one of my favorite activity as a parent too. Thanks for the challenge! Great! I started yesterday but my son wanted me to read the entire poetry book, not just one poem, so I guess it was a successful beginning! Thanks for the great list, Erica! I’ve been subscribing to your site for quite awhile (I found it on Pragmatic Mom), but this is the first time that I’ve commented. I’m a HUGE fan of haiku picture books, and of Wonton especially. I heard her speak at a conference a few years ago & she mentioned a sequel with Wonton and a dog character. I am eagerly awaiting it! Grace Lin’s Our Seasons with seasonal-oriented haikus and a longer nonfiction explanations. For general nature-oriented poetry, I love all of Joyce Sidman’s work–it’s stellar. Marilyn Singer’s reverso poems are amazing in Mirror Mirror and the sequel, Follow, Follow. Thank you so much for leaving a comment, Maria. I love these recommendations you have for more poetry books. A couple of them are new to me and I look forward to checking them out! My first time here at this vibrant world you’ve created. Brava to you. I read in Kindergarten through the volunteer BookPALS effort, of the Screen Actors Guild. I became Intrigued with the young poet-making character, Calpurnia, in THE SECRET RIVER, recently reissued with artwork from Leo & Daine Dillon. Now, I’m on the hunt for titles of picture books, chapter books or even middle grade novels, where a young character also writes poems. If you can help, I’d be in your debt. ps Manhattan is where we brought our daughter as often as we could from her birth state & our re-located home, Florida, to learn about great city parks, museums & sky-high views. She’s now in Boston in college & still loves NYC. That’s a good question about a character who likes to write poems. I’m sure there is one! Thanks for your comment! Thank you for sharing poetry books! I am all up for reading them to kids and experiencing the fun and aliveness of poems. I just self-published my first book; it is a poem mixed up with yoga poses to raise awareness about our beautiful rainforests. I invite to come check out a few posts I wrote about it. Btw, I found you through Kid Lit Blog Hop. Wow! Who knew there were so many children’s poetry books? I used to love reading and writing poetry when I was younger. Thank you for sharing! Thanks for the great selection of children’s poetry books. Going to look into these. Stopping by from the Kid Lit Blog Hop!